1استادیار پردیس کشاورزی و منابع طبیعی دانشگاه تهران. 2دانش‌آموخته کارشناسی ارشد، پردیس کشاورزی و منابع طبیعی دانشگاه تهران. 3دانشیار پردیس کشاورزی و منابع طبیعی دانشگاه تهران. زعفران یکی از با ارزش‌ترین گیاهان دارویی و ادویه‌ای در جهان است. با وجود قدمت کشت طولانی این گیاه در کشور، مطالعات اصلاحی محدودی به واسطه تولیدمثل غیرجنسی این گیاه انجام شده است. به منظور ارزیابی تنوع ژنتیکی ژرم پلاسم زعفران ایران، 65 نمونه مختلف زعفران از نواحی عمده کشت در خراسان شامل تربت‌حیدریه، گناباد، مه ولات، قائنات و فردوس جمع‌آوری و از طریق نشانگرهای مولکولی مورد مطالعه قرار گرفت. آغازگرهای RAPD و ISSR به کار رفته به ترتیب 43 و 122 مکان نشانگری و در مجموع 165 مکان نشانگری چندشکل با میانگین 5/7 نشانگر به ازای هر آغازگر تولید نمودند. شاخص تنوع در دامنه 7/0 تا 36/0 با میانگین 23/0 به دست آمد. همچنین شاخص نشانگری با میانگین 16/0 در دامنه 7/0 تا 24/0 متغیر بود. نمونه‌های مربوط به نواحی قائنات و مه ولات به ترتیب دارای بیشترین (03/83 درصد) و کمترین (73/52 درصد) چندشکلی بودند. گروه‌بندی نمونه‌های زعفران مورد مطالعه با استفاده از تجزیه خوشه‌ای نشان داد که چهار گروه متمایز حاصل با محل‌های جمع‌آوری آن‌ها مطابقت کمی داشتند، درحالی‌که گروه‌بندی مولکولی مناطق کشت زعفران تطابق نسبتاً مناسبی با فواصل جغرافیایی مربوطه داشت. به‌طورکلی، نتایج تجزیه مولکولی در این مطالعه حاکی از وجود تنوع ژنتیکی در بین نمونه‌های زعفران ایران بود. از این‌رو، امید می‌رود از طریق گزینش کلون‌های برتر، پیشرفت‌هایی از نظر بهبود عملکرد کمی و کیفی زعفران حاصل شود. Saffron (Crocus sativus L.) is one of the most valuable medicinal and spice herbs in the world. In spite of the ancient cultivation history in Iran, there are limited breeding studies on the plant due to its vegetative reproduction. In order to evaluation genetic diversity of Iranian saffron germplasm, sixty-five different saffron accessions from the main cultivation areas in Khorasan including Torbat heidarieh, Gonabad, Mahvelat, Ghaenat and Ferdows were collected and were studied by molecular markers. The used RAPD and ISSR primers produced 43 and 122 polymorphic markers loci, respectively, and totally 165 markers with average of 7.5 markers by each primer, totally. Diversity index ranged from 0.36 to 0.7 with average of 0.23. Also, marker index with the average of 0.16 varied in the range of 0.2 to 0.7. The accessions from Ghaenat and Mahvelat had the maximum (83.03%) and the minimum (52.73%) polymorphism, respectively. Grouping the studied saffron accessions using cluster analysis displayed four distinct groups which had little correspondence to their collection areas, while clustering for the main cultivation areas had relatively good correspondence to their geographical distances. So, it is expected to have nearly approaching improvements of qualitative and quantitative yields via the selection of superior clones of saffron. Key words: Saffron, Molecular variation, Germplasm, RAPD, ISSR, Khorasan region, clustering . Abdullaev, F.I. 2004. Antitumor effect of saffron (Crocus sativus L.). Overview and perspectives. Acta Horticulturae 650: 491-499. Aghayev, Y.M., Fernandez, J., and Zarifi, E. 2009. Clonal selection of saffron (Crocus sativus L.): the first optimistic experimental results. Euphytica 169 (1): 81-99. Baghalian, K., Shabani sheshtamand, M., and Jamshidi, A.H. 2010. Genetic variation and heritability of agromorphological and phytochemical traits in Iranian saffron (Crocus sativus L.) population. Industrial Crops and Products 31: 401-406. Dellaporta, S.L., Wood, J., and Hicks, J.B. 1983. A plant DNA minipreparation version II. the journal of Plant Molecular Biology 1: 19-21. Fatehi, M., Rashidabady, T., and Fatehi-Hassanabad, Z. 2003. Effects of Crocus sativus petals’ extract on rat blood pressure and on response induced by electrical field stimulation in rat isolated vas deferens and guinea-pig ileum. Journal of Ethnopharmacology 84 (2-3): 199-203. Fernandez, J.A., Santana, O., Guardiola, J.L., Molina, R.V., Heslop-harison, P., Borbely, G., Branca, F., Argenyto, S. Maloupa, E., Talou, T., Thiercelin, J.M., Gasimov, K., Vurdu, H., Roldán, M., Santaella, M., Sanchí, E., García-luis, A., Suranyi, G., Molnár, A., Sramko, G., Gulyas, G., Balaz, E., Horvat, L., Rudríguez, O., Snchez-vioque, M.R., Escolano, M.Á., Krigas, N., Pastor, T., Renau-morata, B., Raynaud, IBADLI, O., Polissiou, M., Tsimidou, Z.M., Tsaftaris, A., Sharaf-Eldin, M., Medina, J., Constantinidis, T., Karamplianis, T., and de Los Mozos Pascula, M. 2011. The world saffron and crocus collection: strategies for establishment, management, characterisation and utilisation. Genetic Resources and Crop Evolution 58: 125-137. Gresta, F., Avola, G., Lombardo, G.M., Siracusa, L., and Ruberto, G. 2009. Analysis of flowering, stigmas yield and qualitative traits of saffron (Crocus sativus L.) as affected by environmental conditions. Scientia Horticulturae 119: 320-324. Gresta, F., Lombardo, G.M., Siracusa, L., and Ruberto, G. 2008. Saffron, an alternative crop for sustainable agricultural systems. Agronomy for Sustainable Development 28 (1): 95-112. Grilli Caiola, M., Caputo, P., and Zanier, R. 2004. RAPD analysis in Crocus sativus L. accessions and related Crocus species. The Journal of Plant Biology 48: 375-380. Grilli Caiola, M., Di Somma, D., and Lauretti, P. 2001. Comparative study of pollen and pistil of Crocus sativus L. (Iridaceae) and its allied species. Annals of Botany 1 (2): 73-82. 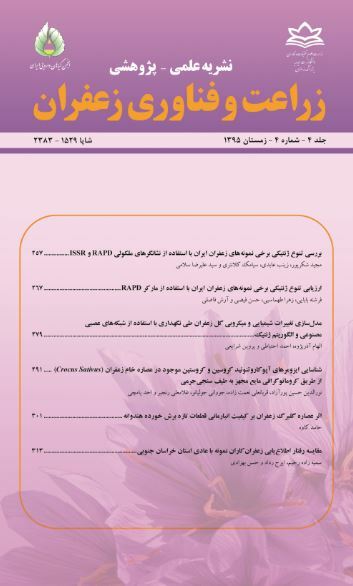 Izadpanah, F., Kalantari, S., Hassani, ME., Naghavi, M.R., and Shokrpour, M. 2015. Molecular and morphological variation in some iranian saffron (Crocus sativus L.) Accessions. Genetika 47 (2): 711-722. Keify, F., and Beiki, A.H. 2012. Exploitation of random amplified polymorphic DNA (RAPD) and sequence related amplified polymorphism (SRAP) markers for genetic diversity of saffron collection. Journal of Medicinal Plants Research 6 (14): 2761-2768. Koochakzadeh, S., and Karbasi, A. 2015. Study of the effective factors on the commerce of Iranian Saffron. Journal of Saffron agronomy and Technology 3 (3): 217-227. (In Persian with English Summary). Loscutov, A.V., Beninger, C.W. Hosfield, G.L., and Sink, K.C. 2000. Development of an improved procedure for extraction and quantitation of safranal in stigmas of Crocus sativus L. using high performance liquified chromotography. Food Chemistry 69: 87-95. Maggi, L., Sánchez, A.M., Carmona, M., Kanakis, C.D., Anastasaki, E., Tarantilis, P.A., Polissiou, M.G., and Alonso, G. 2011. Rapid determination of safranal in the quality control of saffron spice (Crocus sativus L.). Food Chemistry 127: 369-373. Mousavi, S.H., Tayarami, N.Z., and Parsaee, H. 2001. Protective effect of saffron extract and crocin on reactive oxygen speciesmediated high glucose-induced toxicity in PC12 cells. Cellular and Molecular Neurobiology 30: 185-191. Nair, S.C., Pannikar, B., and Panikkar, K.R. 1991. Antitumour activity of saffron (Crocus sativus). Cancer Letters 57 (2): 109-114. Pardo, J., Fernández, J.A., and Gómez, L.G. 2004. Development of molecular markers for origin determination in saffron. Acta Horticulturae 650: 95-98. Peakall, R., and Smouse, P.E. 2006. Genalex 6. Genetic analysis in Excel. Population genetic for teaching and research. Molecular Ecology Notes 6: 228-295. Rubio Moraga, A., López, M., Gómez, R., and Ahrazem O. 2009. Saffron is a monomorphic species as revealed by RAPD, ISSR and microsatellite analyses. BMC Research Notes 2: 189-193. Rubio Moraga, A., Traper-Mozos, A., Gomez-Gomez, L., and Ahrazen, O. 2010. Intersimple sequence repeat markers for molecular characterization of Crocus cartwrightianus cv. albus. Industrial Crops and Products 32: 147-151. Siracusa, L., Gresta, F., Avola, G., Albertini, E., Raggi, L., Marconi, G., Lombardo, G.M., and Ruberto, G. 2013. Agronomic, chemical and genetic variability of saffron (Crocus sativus L.) of different origin by LC-UV–vis-DAD and AFLP analyses. Genetic Resources and Crop Evolution 60 (2): 711-721. Siracusa, L., Gresta, F., Avola, G., Lombardo, G.M., and Ruberto, G. 2010. Influence of environmental factors and corms provenience on yield and apocarotenoid profiles of saffron (Crocus sativus L.). Journal of Food Composition and Analysis 23: 394-400. Soheilivand, S., Agayev, Y.M., Shakib, A.M., and Fathi, M. 2007. Comparison of diversity in flowering rate of two Saffron (Crocus sativus L.) popultion of Iran. Acta Horticulturae 650: 317-320. Tamaddonfard, E., and Hamzeh-Gooshchi, N. 2010. Effect of crocin on the morphine-induced antinociception in the formalin test in rats. Phytotherapy Research 24: 410-413. Zubor, A.A., Suranyi, G., Gyori, Z., Borbely, G., and Prokisch, J. 2004. Molecular biological approach of the systematics of Crocus sativus L. and its allies. In F. Abdullaev (ed). First international symposium on saffron biology and biotechnology. pp, 85-93. Nei, M. 1972. Genetic distance between populations. The American Naturalist 106: 283-292.